At the Tokyo Motor Show Volkswagen is showcasing its concept of an SUV of the future: the Cross Coupé. Visually the all-wheel-drive plug-in hybrid vehicle shows how Volkswagen designers could envisage a crossover between a four-door coupé and a compact SUV. The design team led by Walter de Silva and Klaus Bischoff have created a fascinating study that impressively combines the best of two worlds. 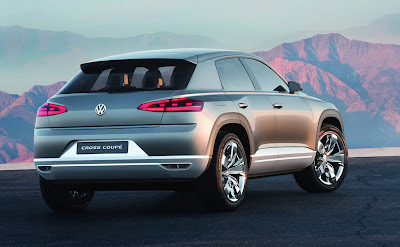 Original, strong in character, sculptural and dynamic, the Cross Coupé stands for the future of SUV design at Volkswagen! Pioneering technologies. Technically too the very sporty Cross Coupé concept car defines a new status, being based on Volkswagen’s new modular transverse matrix (MQB) – the first such model ever to be publicly shown. Features of the Cross Coupé consequently include strikingly short bodywork overhangs. The four-seat SUV is powered by two electric motors (1 x front, 1 x rear) and a direct injection turbo petrol engine (TSI). The Cross Coupé can drive a distance of up to 45 kilometres purely on electric power. The all-wheel drive system with ‘electric drive shaft’ represents an innovation for Volkswagen, with the rear axle being driven by the rear of the two electric motors. In this situation power is supplied to the rear electric motor by the one at the front, which during this phase acts as a generator powered by the TSI engine. In the Cross Coupé the flow of electrical energy thus replaces the conventional transfer of power by means of a drive shaft. And that creates room on board the concept car for another important technology: the centre tunnel, usually the place for the drive shaft, houses the lithium ion battery (tunnel battery) on the Cross Coupé. The low position of the battery and the general layout of the drive systems give the vehicle a very low centre of gravity and facilitate a balanced spread of axle loading. Although equipped with the all-round qualities of an SUV, the concept car therefore demonstrates the dynamic handling of a coupé. Less upright than other off-road vehicles. At 4,345 mm, the concept car being shown in Tokyo is longer than a Golf and shorter than a Tiguan. The width of 1,868 mm and height of 1,523 mm also come exactly in between these two bestsellers. In terms of its dimensions, the Cross Coupé is therefore a vehicle in the globally much in-demand A segment. It is also noticeable that at 2,630 mm the concept car has what in relation to its overall length is a very long wheelbase (52 mm longer than the Golf and 26 mm longer than the Tiguan). The bodywork overhangs (855 mm at the front and 860 mm at the back) are correspondingly short. All of the dimensions combined, the overall proportions are extremely snappy. The powerful look is underlined by large wheel tracks of 1,585 mm (front) and 1,613 mm (rear). Off-road figures like an SUV. Away from made-up roads the Cross Coupé makes its mark with bodywork figures that fall almost into the range of classic SUVs. The front angle of approach, for example, is a good 24.2 degrees and the rear in terms of off-road use an excellent 32.5 degrees. The Cross Coupé also features good off-road ground clearance. Precisely moulded coupé silhouette. Defining features of the Cross Coupé’s look are the very long bonnet, a completely new front section design, the passenger compartment, which is set way back, and in comparison to conventional SUVs the very low window line. In general the designers have also achieved muscular and athletic, yet very clear contours. The Cross Coupé gives the appearance of a sculpture milled from a solid material: extremely precise and modern. Highly independent, the Cross Coupé shows the direction in which Volkswagen design is developing. One striking element is a shoulder line, also known as the tornado line, that looks as if it has been cut with a razor blade, which runs just below the frameless windows, extending from the front to the rear wing. Adjacent to the line to the bottom are the clearly flared wings, which create a very powerful sideline and produce a silhouette that – although robustly composed in the style of an SUV – is reminiscent of a sports car. Fitting perfectly into this picture come the 20-inch alloy wheels, equipped with 265/45 tyres. To the rear a voluminous coupé-like C column rises up over the wheel arches and in silhouette the entire rear of the car appears to rest on the 20-inch alloys. The evolution of the Volkswagen front section. 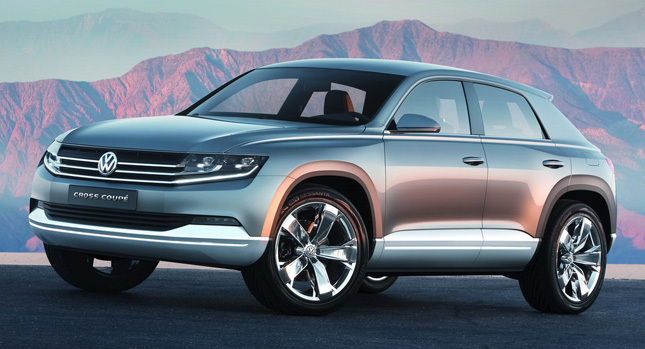 The great potential of the Volkswagen design DNA developed by Walter de Silva (Group Chief Designer) and Klaus Bischoff (Volkswagen Chief Designer) is shown by the concept car’s front section. In this instance, the characteristic horizontal lines of the ‘Volkswagen visage’ become a link between present and future. Unlike on today’s models, the designers have physically merged the two xenon twin headlamps with the radiator grille’s chrome-plated fins. In detail, it is two chrome bars, one above the other, that link the headlamps. Moreover, the chrome fins that ascend to the sides of the vehicle emphasise its width and are part of an entirely new type of lighting concept; the lower of the two chrome fins contains the daytime running light, and the fin above it contains the direction indicators. The light signature, headlights and grille are all expressed in a unique innovative combination. In the centre of the bumper is an area painted in the vehicle’s colour, which by means of a precisely shaped character line extends upwards to form a homogenous unit with the bars of the radiator grille. Right at the bottom of the bumper is another cold air inlet, which is fitted with two additional smaller chrome bars. To the left and right of each inlet are the LED fog lights. The rear of an SUV coupé. The shallow line of the side windows also influences the rear of the car. Incorporated at a very sloping angle, the rear window is typical of a coupé. To the top rear the hatchback is finished off by a spoiler, which optically extends the roof surface and as a trailing edge technically optimises the aerodynamics. The rear light clusters are kept slim. In similar fashion to their counterparts on the latest production models, such as the new CC, the rear lights feature a delicate, pale, horizontal bar that makes the lamps look very elegant. Typical of an SUV, meanwhile, is the chunky rear bumper, integrated into the left and right of which are the exhaust pipes. Multifaceted interior for four people. The best of two worlds. In the Cross Coupé the worlds of the SUV and the coupé form an exciting alliance. Inside this four-seater this leads to all details having a significantly sportier design than in conventional SUVs. For example, the dashboard: it has the dynamically precise lines of a coupé, yet is raised up like in an SUV. The surface of the dashboard exudes very refined quality, yet at the same time a very robust design. This robustness is also a feature of the controls, handgrips and general feel of things in the car’s interior. For example the centre console: the drive system and air-conditioning functions are controlled quickly and simply via two aluminium rotary switches. Located between the two switches is the button for the electric parking brake and in front of that the gear lever, also in aluminium, for the seven-speed direct shift gearbox (DSG). The lever’s strikingly wide grip is not only visually fun, but being made out of one piece also pleasing to the touch. In front of the gear lever is the start button for the engines, while to the left and right of the lever there are two robust but elegant grab handles. On the right there are also the buttons for selecting pure electric power and battery charging. Higher up come the ventilation controls, the centrally positioned hazard warning lights switch and two air vents. Another level higher there is a touchscreen display that shows on- and off-road navigation and all relevant vehicle functions, extending all the way to the sound system. Programmable instruments. Arranged behind the three-spoke steering wheel is a user-programmable instrument cluster display. A rotary control knob on the centre console can be used to dynamically select between three different display modes: ‘Sport’, ‘City’ and ‘Offroad’. The functional screen contents of the modes vary according to the mode selected, e.g. gyrometer, compass and topographic map in Offroad mode. Each of the three modes has a customised screen layout and different colour scheme. Positioned centrally between the round instruments is another multifunction colour display, on which vehicle information, the phone menu, audio details and alongside this further navigation data such as a 3D off-road picture can be shown. Ergonomics for long journeys. The Cross Coupé is fitted with four individual seats, which have all been designed as bucket seats with solidly integrated headrests. These seats have particularly well-balanced ergonomic qualities. The four passengers have ample room to the side, in front and above. The backs of the rear seats and of the front passenger’s seat can be folded fully forwards to load surfboards, paragliders or other bulky gear into the Cross Coupé. A particularly helpful feature here is that the seat backs have an outer synthetic covering, so that when folded down they form a durable surface for such loads. The boot space behind the rear seats has a capacity of 380 litres (up to the window edge). If the 1,724 mm-long vehicle interior is loaded up to roof height and all the way to the backs of the front seats, the capacity increases to 1,230 litres. Three motors in one car. The Cross Coupé has not one but three motors, which work together efficiently as a hybrid system. At the front under the bonnet is a 110 kW TSI petrol engine delivering maximum torque of 210 Nm and an electric motor with an output of 40 kW and 180 Nm of torque. Together or individually these two motors power the front axle. If the Cross Coupé is to be used in all-wheel drive or pure electric power mode, a further electric motor cuts in. This has been integrated as a co-axial drive unit into the rear axle layout. This motor drives the rear wheels. This second electric motor generates up to 85 kW and develops torque of 270 Nm. The overall output of the system (petrol engine + battery) is a maximum of 195 kW. Tunnel battery powerhouse. When the vehicle is being driven purely on electric power, the electric motors receive their current from an 8-module lithium ion battery. The battery holds 9.8 kWh of energy and is located inside the Cross Coupé’s centre tunnel, i.e. where the drive shaft is found in conventional SUVs. An electronic power control module, operating at around 370 volts and integrated into the engine compartment, manages the flow of high-voltage energy from and to the battery and to the electric motors. Meanwhile, the Cross Coupé’s low voltage electrical system is supplied with the necessary 12 volts through a DC/DC converter. The electric drive system causes no space restrictions in the vehicle’s interior. The battery gets charged either via external electricity sources (230-volt connection) or – in motion – via the TSI engine and battery regeneration (both front and rear axles). Fuel consumption of just 2.7 litres per 100 km. With a full tank of fuel the Cross Coupé weighs 1,748 kg (58% on the front axle, 42% on the rear). It can take a further load of 450 kg and be driven a distance of up to 45 km on purely electric power. In doing so the vehicle produces no emissions. In the New European Driving Cycle (NEDC) the TSI engine’s fuel consumption is just 2.7 litres per 100 km, equating to CO2 emissions of only 62 g/km. With a fuel tank capacity of 55 litres, the theoretical range in hybrid mode is 815 kilometres. Adding in the electric range, the Cross Coupé can do 855 km without stopping for fuel. Sustainable and yet still dynamic. Despite the focus on sustainability the concept car being shown in Tokyo is still sporty. The Cross Coupé accelerates from 0 to 100 km/h in just 7 seconds and has a top speed of 201 km/h. If forward propulsion is being provided solely by the electric motors, the top speed is regulated down to 120 km/h. Both the consumption figures and driving performance are positively influenced by the Cross Coupé’s aerodynamic properties. The optimally balanced aerodynamics built into the design and the very low overall height (for an SUV) produce a very good drag coefficient of 0.329. How the hybrid drive system works. Both electric motors help (boost) the petrol engine (TSI) during acceleration. As mentioned above, however, they can also power the concept car on its own for a distance of up to 45 kilometres, depending on conditions. Here, by opening the clutch, the TSI gets disconnected from the drive-train and switched off. The clutch on the gearbox side, however, remains closed and the seven-speed DSG thus remains connected. Cross Coupé drivers can themselves also choose to drive relatively long distances on pure electric power (as long as the battery has enough charge). To do so the driver simply presses the relevant driving mode button on the centre console next to the gear lever. As soon as the TSI needs to be brought back into play due to the battery’s level of charge or any other parameters, the engine starts up – almost imperceptibly for driver and passengers – and smoothly engages with the drive train. Charging at the press of a button. Whenever the Cross Coupé’s brakes are applied, both electric motors act as a generator, utilising the braking energy to charge the battery (battery regeneration). The driver can (via another button next to the gear lever) also consciously charge the battery from the TSI engine – for instance, in order to have sufficient electric power to drive later in a regulated zone preserved exclusively for zero-emission electric vehicles. At all times, the current electric range and the Cross Coupé’s overall range are displayed on the instrument panel. The engine controller regulates all energy flow and drive management tasks taking into account the minute-by-minute demands for power made by the driver. ‘Electric power’, ‘Charge’ and three further modes. Based on the amount of drive (for instance, loss of traction on the front axle) or through the driver consciously switching to all-wheel or electric mode, the second electric motor integrated with the rear axle engages it in an instant. In general there are three driving modes available to the driver: City (eco-mode with minimal fuel consumption), Sport (dynamic driving) and Offroad (permanent all-wheel drive).